The city of Jaipur, located in the famous Indian state of Rajasthan, is one of the most popular cities to visit in North India. The “Pink City,” as it's nicknamed, offers numerous attractions and a glimpse into Rajasthani Indian culture. We'll begin our tour of Jaipur right in the center of the town. The most famous landmark of the city is the Hawa Mahal, a building that's known for its five story wall filled with 953 small windows. The palace represents a beehive and it was designed for a breeze to flow through. Once you're inside the main entrance of the Hawa Mahal (on the opposite side), you can climb around the palace, walk around each level, and even climb to the very top to have a look out the window. 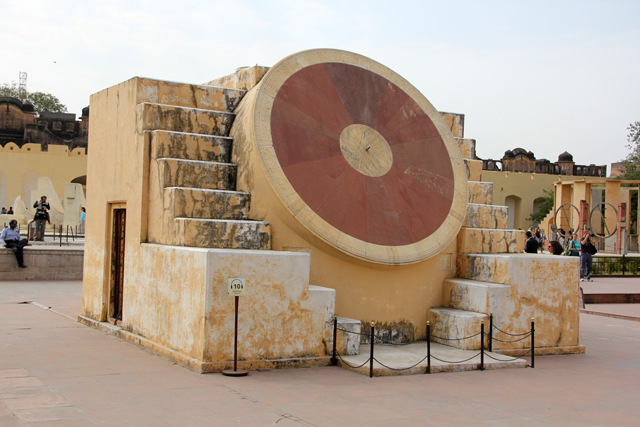 Next to the Hawa Mahal is Jaipur's Jantar Mantar, a compound filled with a variety of instruments that were specifically designed for astronomy research. Among the many objects, some were used to track the cycles of stars and planets, and others were used to tell the time. Due to the complexity of this UNESCO World Heritage sight, if you visit Jantar Mantar, it's best to either hire a guide from the entrance, or to rent the self audio tour to make sense of all the complicated instruments. 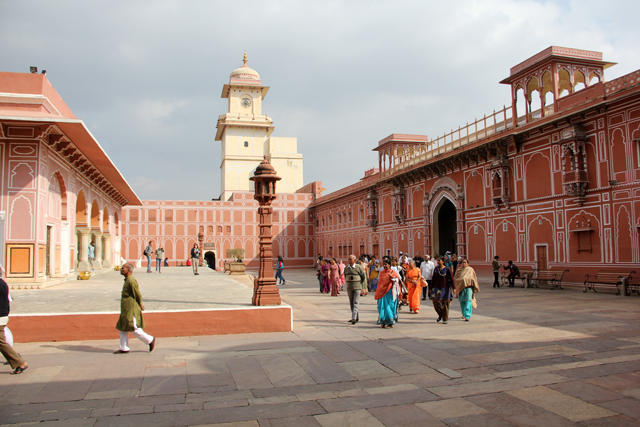 The City Palace in Jaipur was formerly the capital of the state of Rajasthan. Now the palace is a museum where you can walk around the complex and see the many different exhibitions occupying various halls. The intricately painted wall murals in the inner courtyard are very impressive with colorful patterns etched into the doorways. You can also see the world's largest sterling silver vessels which were used to hold and transport holy water from the Ganges river for Maharaja Sawai Madho Singh II. 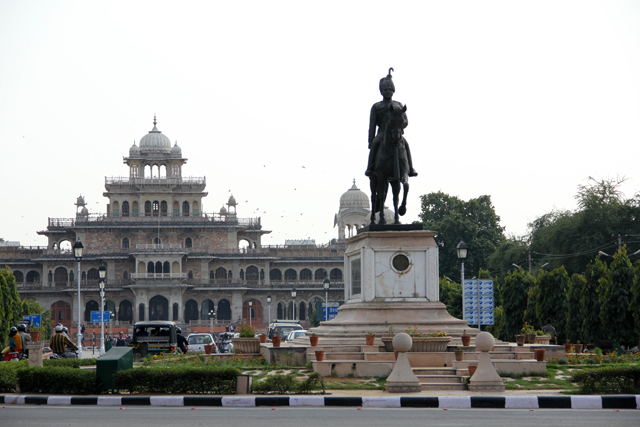 Just outside the old city walls is the Albert Hall Museum, which is the national state museum of Rajasthan. Though the collection at the City Palace is more extensive, if you do enjoy museums, it's worth a visit. Inside you'll find lots of paintings, ceramics, and a good collection of weapons and arms. 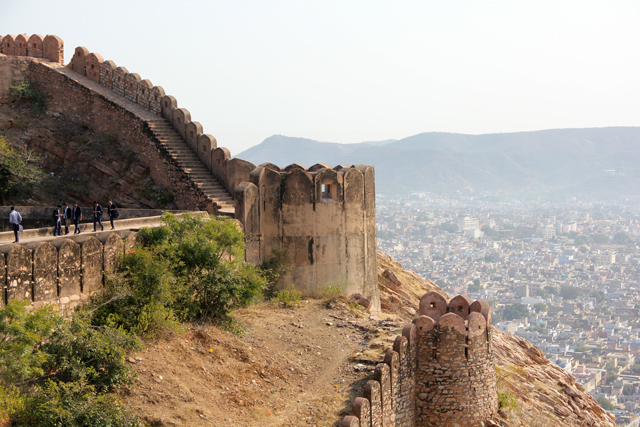 Though the fort is not overly well-preserved, it's the view that's the main attraction at the Nahargarh Fort. You can either take a taxi, or you can choose to hike to the top of the hill which takes a bout 30 minutes. At the top you'll get a great view of the Pink City. Located about 11 kilometers from the Pink City is the Amber Fort, an attraction that just about all tourists who visit Jaipur come to see. From the road, overlooking the lake and surrounded by rolling hills you'll see the mighty fortress. It's interesting to notice the differences between the Rajasthani built Amber fort and the Mughal constructed Agra Fort. Both very impressive but designed in different styles. Since the fort is perched on a small hill you can either walk to the top, or for a small price you can ride an elephant. Each day, the elephants are brightly painted in beautiful Rajasthani designs. 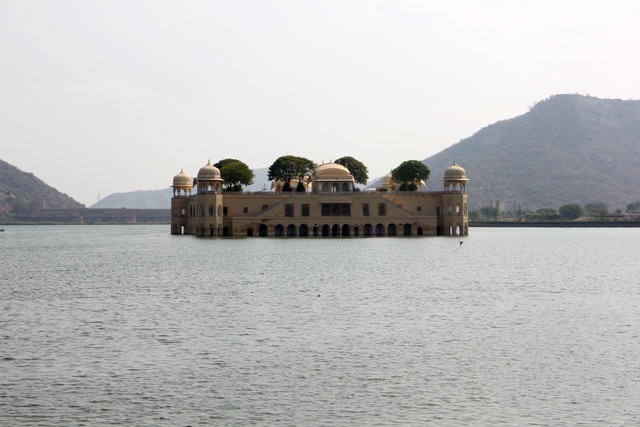 Finally, in-between the center of Jaipur and the Amber Fort is the Jal Mahal, the palace that's famous for being half-submerged in Man Sagar Lake. 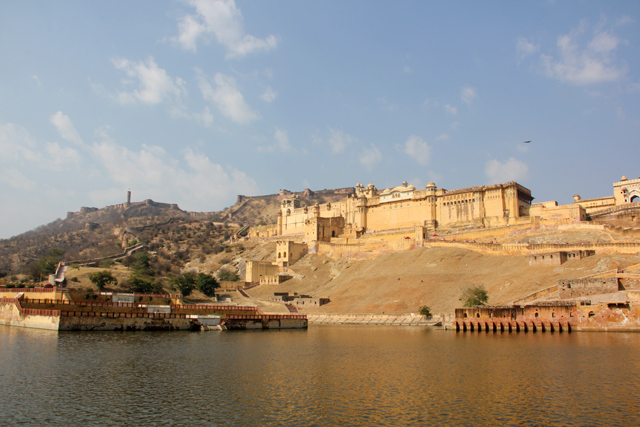 Though you can just see it from the shore, you can also take a Rajasthani boat to the palace to get a better look. 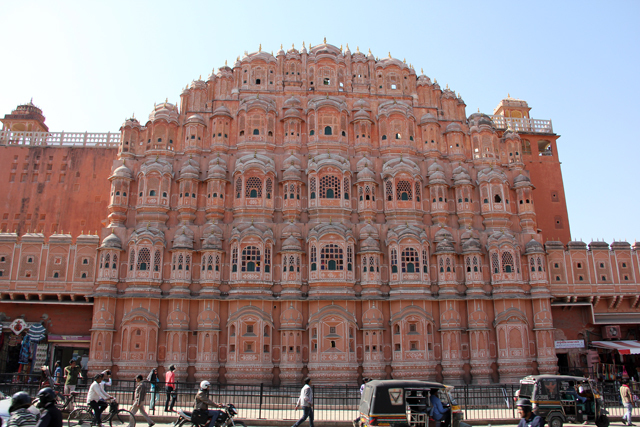 Jaipur is a fascinating city in India and a great place to begin your adventures in Rajasthan. The city offers numerous world-class attractions, a wealth of history, and many interesting places to explore. There are so many -urs to visit in India, and I want to see them all! With every India related blog post, I am becoming more and more sure that I’ll be heading there at some point this year. Jaipur looks very beautiful. I loved Jaipur so much when I visited a few years ago. Pictures can barely give you a glimpse of the city and its beauty. I can’t wait to go back! What a great post, with such gorgeous photos! I’ve never heard of Jaipur, but it’s now on my wishlist. I’ve also included it in Frugal Monkey’s most recent web wrap here: http://www.frugalmonkey.com/travel-news/web-wrap-11-april-2013.html! nice post .i must say awesome.